Wood stoves, gas stoves, electric stoves, pellet stoves, oil-fired stoves, and propane-fueled stoves can fail due to any number of different circumstances brought on by owner neglect, improper installation, manufacturing defects, and many other causes. 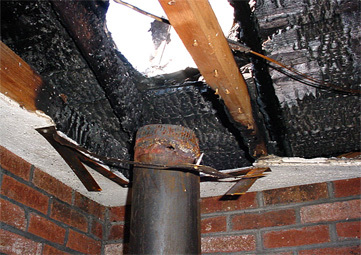 For this wood stove fire, faulty chimney installation was the cause. 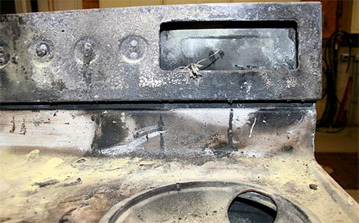 A failure within this electric stove caused a fire that not only destroyed the appliance but caused severe damage to the rest of the kitchen. ISE investigators used our advanced laboratory facilities to determine the cause of the fire. 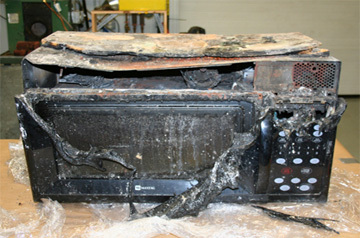 Even small microwave ovens can cause major problems due to failure of their electronic systems. These failures can occur for multiple reasons.